Yes! 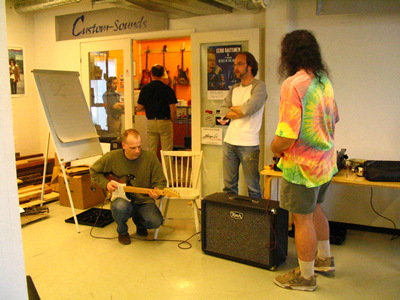 Our friend Marcus Hagström was in contact with many amp builders and hobbyists in Finland, and got together a group to participate in a Workshop with Kevin. 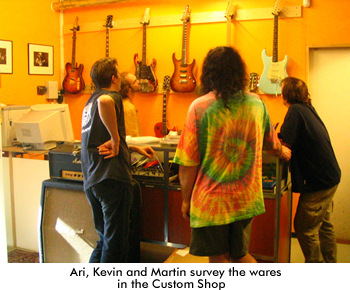 The event was held a week after our 2004 Sweden Workshop, at the "Custom Shop" on the outskirts of Helsinki. 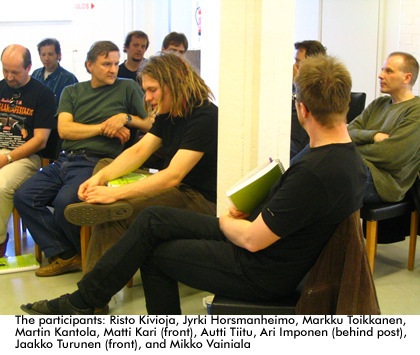 Finland is a very big place, and many of the participants had a long way to travel. Luckily it was a beautiful, bright day and everyone eventually arrived. 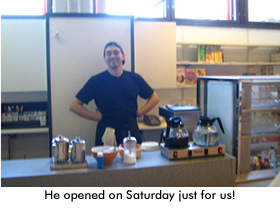 In the mean time, we enjoyed coffee and sandwiches and got to know each other. 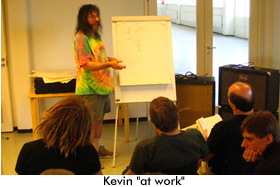 As in his 2003 Sweden Workshop, Kevin began with the basics of tube operation, and used Chapter 1 of The Ultimate Tone Vol. 5 as a starting point. 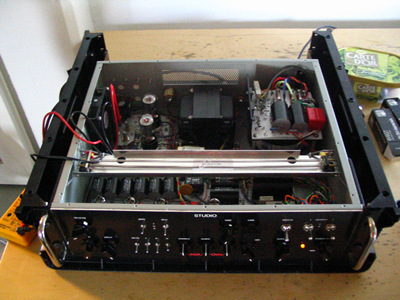 The covered the fundamentals of tube operation, gain stages, and preamp voicing. 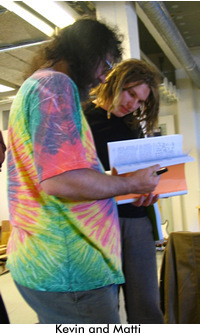 Discussion with the group led to power amp techniques, Power Scaling, speaker considerations and other topics of interest. 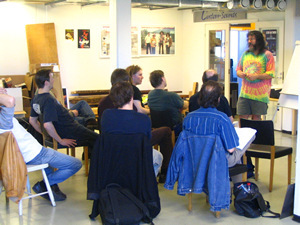 We had a break for lunch, and then resumed the discussion, leading up to a demonstration of the London Power Studio amp. 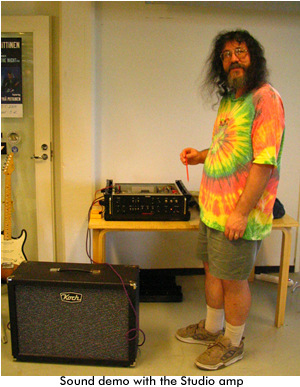 To help us demonstrate the sonic characteristics of Power Scaling, Marcus brought along his London Power Studio amp. Here it is in action! It doesn't move very fast, but it sounds good. 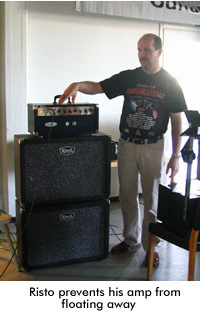 The other features of the amp were easily experienced by the group with help from Marcus's "Neil Young Meets God" playing style. 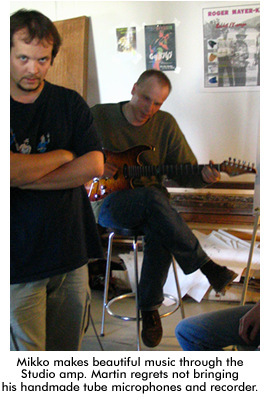 Mikko brought a couple of his own amp projects, and is seen here playing through the Studio amp and a Koch cabinet provided by Ari and the Custom Shop. Mikko proved that the Studio amp is a real metal amp! Mikko also brought along a Marshall amp that had been fully modified using ideas from The Ultimate Tone, demonstrating that "even a Marshall can sound good!" 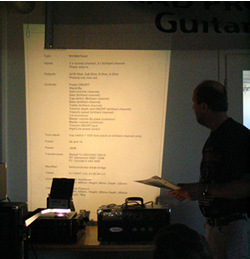 He also brought a "monster" work in progress - a three-channel 100W head using KT88s.THAT one will have headroom! 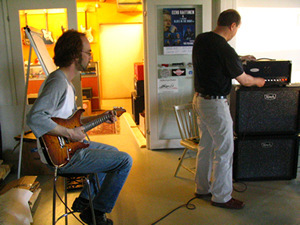 Marcus is shown above playing through one of Risto's Rikstone amps, both of which are based on the Vox AC-30. One was almost a dead copy, but infinitely more serviceable and roadworthy - and even prettier! 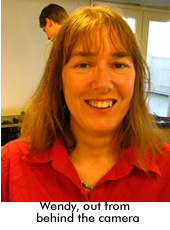 The other was a "super-power" AC-30, using EL34 output tubes. This amp sounded the way everyone wishes a Vox would sound. 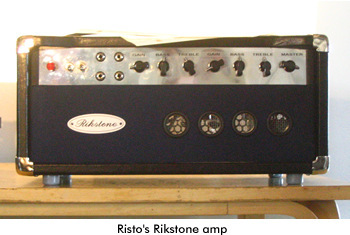 Risto also brought along interesting overheads to detail the evolution and construction of the amp, including schematics and specs. 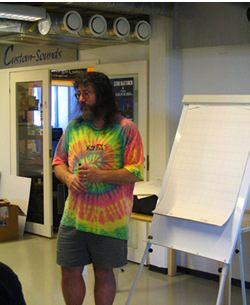 Thank you to all who came to our first workshop in Finland! 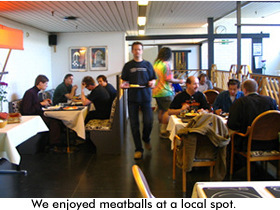 You made us feel most welcome, and we hope to visit Helsinki again soon! 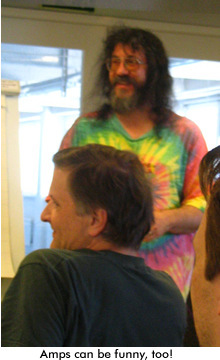 A special thank you to Marcus for all the organizing, and for his kind hospitality. 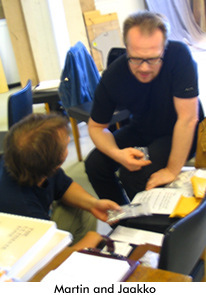 A big thank you also to Ari Imponen of the Custom Shop for lending us the premises to conduct the workshop, and for his help with set-up. 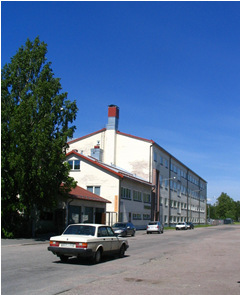 Please visit our "Finland, It's Not What It Used To Be" page!